Hole number per site are 1, 2, 6, 10, 16, 36, repeated four times over the plate to avoid that results can be biased by location of the chip. Assay Development QChips enable easy evaluation of the optimal number of holes per measurement site, to ensure that the perfect assay is setup before initiating large HTS screens. In different cell lines current density can vary significantly and low currents can hinder acceptable signal/noise ratio. 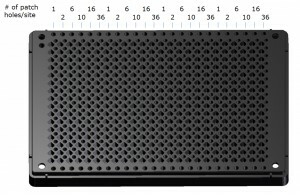 However, the number of holes per measurement site can compensate for this and exactly how many holes per measurement site that are optimal can easily be determined with the QChip384D. Each Assay Development QChip cover hole-numbers from 1 to 36 holes per site (1, 2, 6, 10, 16, 36) enabling easy evaluation of the effect of variation in hole numbers per site, to ensure that the assay is robust and optimized. When optimizing assays, many parameters can be varied and depending on assay setup and purpose the number of holes per recording site can have a significant impact on the performance of the assay and the success of the screen. For screening campaigns of hundreds of thousands of compounds an extra effort should be placed in defining correct parameters, hereunder the optimal number of patch holes per site. Our standard QChips with either 1 or 10 holes per site are suitable for most assays and cell lines, but if another number of holes is identified as optimal, custom QChips can be made to order. 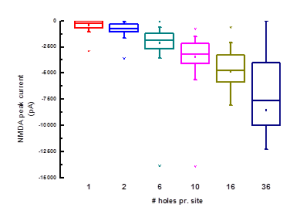 In the shown example data is from recording NMDA currents on the Assay Development QChip. In this case 10 holes per patch site was evaluated as good for this particular assay and the remaining of the screen with NMDA were run with QChip 384X with 10 holes. Fig.3. Percentage of sites with less than 300 pA current and CV as a function of number of holes per patch site. 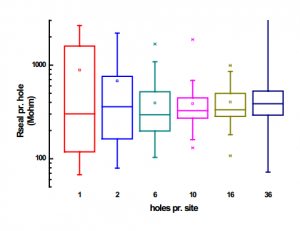 Number of sites with less than 300 pA current decreased with hole numbers and no sites with less than 300 pA was found using QChips with 10 holes. 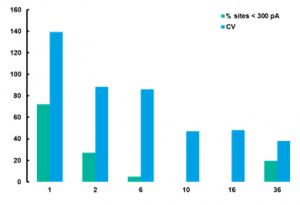 Also CV decreased with number of holes per patch site.